That’s also an incredibly calorific side dish: A meal it ain’t. Although I sometimes crave a big splodge of cheese-saturated carbs I can’t say I would want it as a meal. Not even if it is married on the plate with a blameless green salad. I have a similar relationship with mac and cheese. I get bored. I get full. I get up to change into stretchy trousers. I go to sleep. I do however love the idea of layering vegetables with a bit of cheese and herbs, and tucking in with a big spoon. It is with this thought – and the unvarnished truth that the simplest way to parlay veg into a family-friendly recipe is to stick it in a gratin – that I made this healthy vegetable gratin. Gratins are a cinch, especially if you bear in mind a couple of things. None of these are crucial but I think they help give the best result. Ignore me if you are already a keen gratin aficionado. First of all, the easiest way to approach a healthy (ie not swimming in double cream) gratin made with harder, wintery-type vegetable is to lightly cook them beforehand. Lightly roast, saute, griddle, steam, boil – whatever is your preference. Then it is just a matter of deciding which cheese and herbs you fancy, whizzing some breadcrumbs (fresh is best but who can say no to panko) and proceed to build a mini fortification of vegetables. During the cooking the vegetables will collapse, release their natural moisture and, crucially, intensify their flavour. If you use all hard vegetables – like potatoes and celeriac – they will need a little stock or milk added to the dish. For most summer vegetables you can just layer up with cheese and shove in the oven. The second consideration is the cooking vessel. I was lucky enough to pick up a French tian at TK Max, but any heavy, shallow, wide dish will do – Pyrex is good. 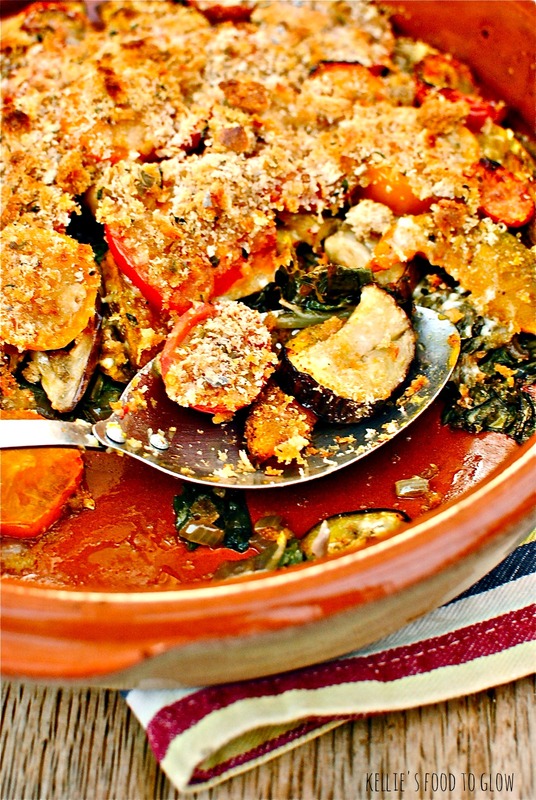 Incidentally, tian is not only the name of the actual cookware but also describes Provencal vegetable gratins. A bit confusing! 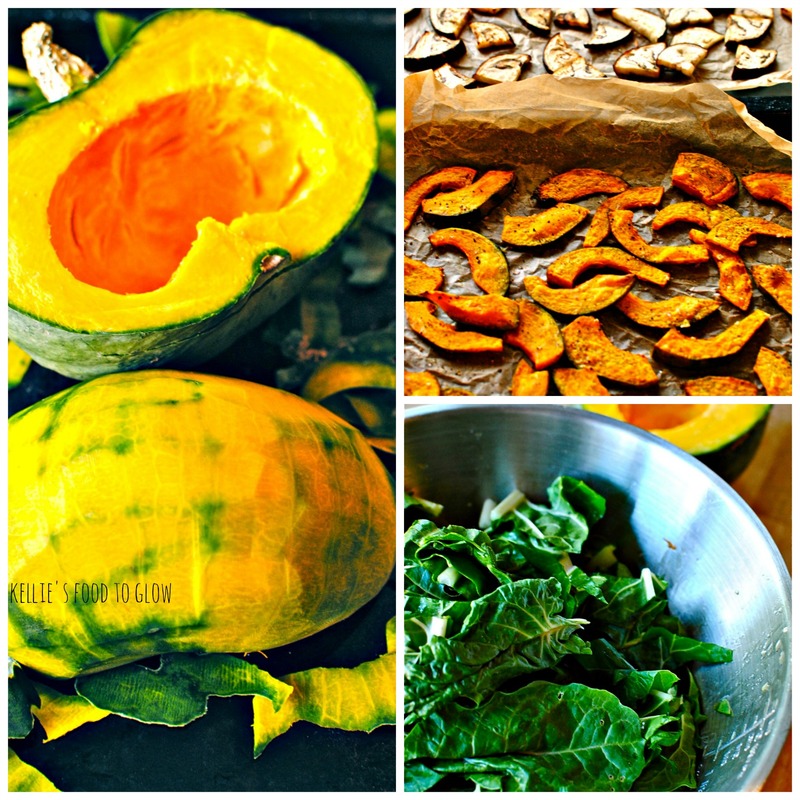 This is just a personal preference, but for the most part I like to balance out sweeter vegetables – like pumpkin – with something green. This also goes for if making a (slightly) creamier version. I like to think it balances out the calories of a creamy gratin, but of course it sadly does not. Lastly, use good produce. Out of season, shipped-from-goodness-knows-where vegetables will stand out – for all the wrong reasons. Gratins are simple, and reliant on the inherent taste of the produce. Poor-quality vegetables have nowhere to hide, unless it is behind a heart-stopping cloak of double cream and cheese. Seasonal is also cheaper and more nutritious, too. This is a stripped-back, easily-made gratin, far removed from something you might pay good money for at a nice restaurant. But I would stick my neck out and say that it is just as nice, but in a different way. A healthy way. And you can eat a good portion of it without feeling like you need to take a week off to digest it. In something so simple it is imperative to have tip-top ingredients – vegetables, cheese, bread. Although this gratin is all about the seasonal vegetables, best quality cheese and good, fresh breadcrumbs bring it all together into something more than the sum of its parts. And vegans, this will be great with a good quality vegan cheese or use some vegan cream with garlic grated in and a pinch of mustard. 2 handsful of strongly flavoured, freshly grated cheese, such as a farmhouse or artisan cheddar (vegetarian Parmesan or feta would be good too). Vegan cheese if you like. Good bread – a mounded handful – blitzed in a food processor with 2 tsp fresh thyme leaves and a three-finger pinch of salt and pepper (I used a hunk from a day-old Polish rye and spelt bloomer and some smoked Maldon salt). 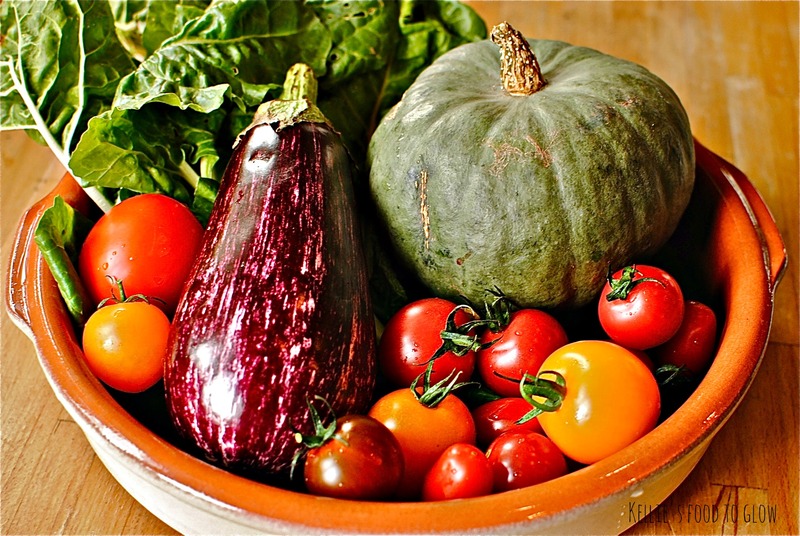 Prepare the vegetables: Finely dice the onions; mince or press the garlic; shred the chard/spinach; peel, deseed and chop the squash; slice the aubergine into large ‘coins’ and quarter the coins; slice the larger tomatoes. Heat the oil in a sauté pan and gently fry the onion and garlic for a couple of minutes; add the chard and sauté until the chard is limp. If you use spinach you may wish to squeeze out some the liquid from the cooked spinach, but you still want a good bit of moisture. Set aside. Toss the butternut squash in 2 teaspoons of oil and lay on a baking tray; use the rest of the oil on the aubergine slices (or use oil spray) and put on a tray. Bake both vegetables for 15 minutes in a 180C/350F oven. Keep the oven on. To assemble: Oil or butter a large gratin dish or similar. Spread the chard and onion mixture on the bottom, followed by the cooked squash; sprinkle over half the cheese and most of the thyme leaves. Scatter over the aubergine, followed by the tomatoes; sprinkle over the remaining cheese and thyme, followed by the breadcrumbs. 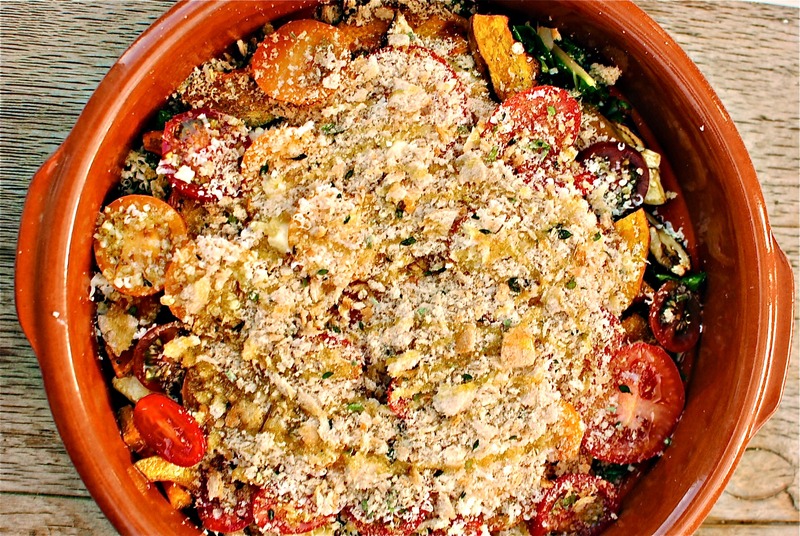 Drizzle olive oil over the crumbs and on ‘bare’ vegetables. Bake in the oven for 25-30 minutes, or until the top is golden and it looks ‘done’. Serves 4. Any leftovers are nice cold too. 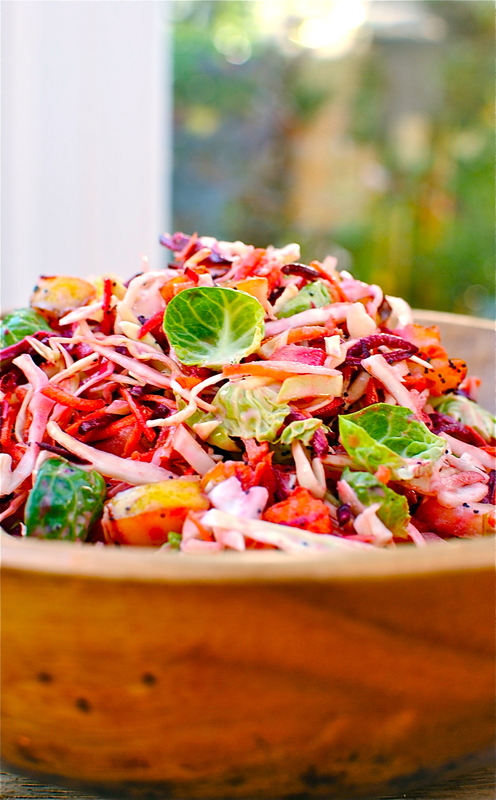 We had this with a pear and buttermilk dressing coleslaw (recipe soon). Note: try a mix of smoked and regular cheddar for extra interest; add a layer of canellini beans for more protein, or instead of the cheese. This week I am popping this autumn recipe over to Four Season Food for the Sliding Into Autumn theme. 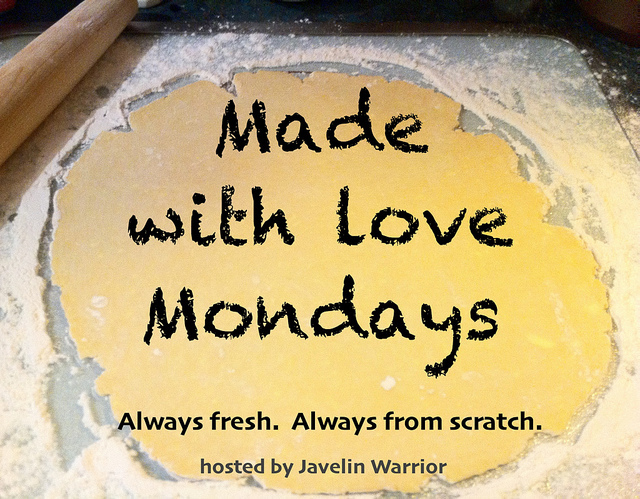 This challenge is curated by Anneli of Delicieux and Louisa at Eat Your Veg. Thanks for this wonderful theme! I would also like to send this to Mark at Javelin Warrior’s Cookin’ W/ Luv Made With Love Mondays to give homey punctuation to all of the gorgeous cakes. And also over to Lavender and Lovage for Karen’s delightful and eclectic Cooking With Herbs . Your thoughts on cream-heavy gratins really struck a chord, will be trying this lighter and healthier version soon, thanks for sharing! 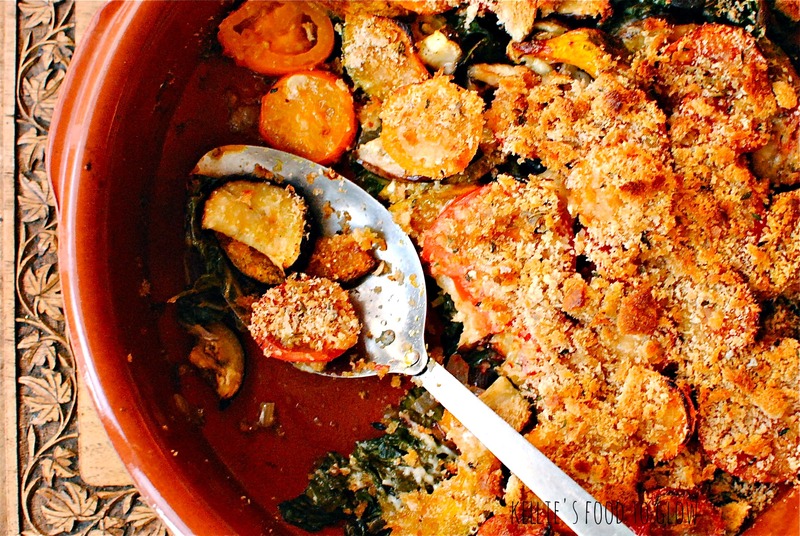 Love this recipe too Kellie & the excuse to indulge in a ‘healthy gratin’ -just right for this weather! This sounds amazing and your pictures just make it look even more amazing!! I love all the colors and the use of fall vegetables! 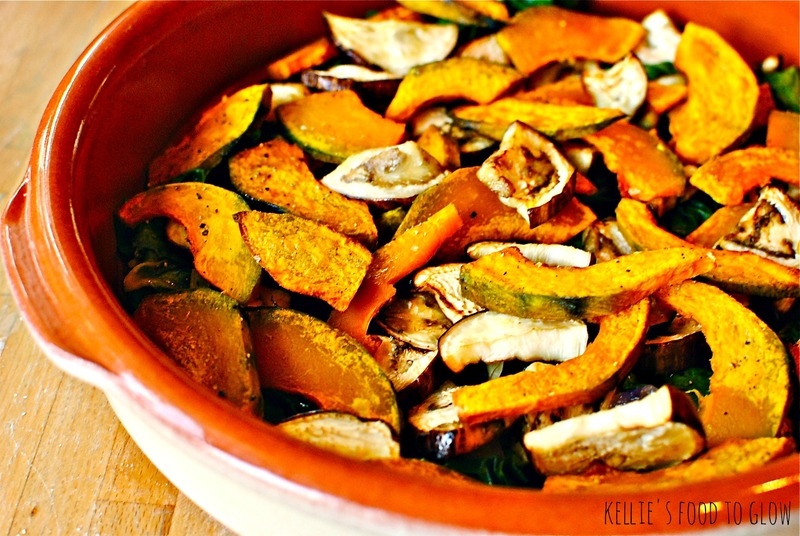 I haven’t tried onion squash or aubergine but they look really good in this dish! It looks absolutely delicious and such a versatile recipe… a savory crumble more than a gratin, good idea! I don’t like most vegan “cheezes” and most of them don’t melt convincingly (the ones that “I” can buy in our local supermarkets here in Northern Tasmania that is 😉 ). I would probably go with Susan Voisin’s amazingly unctuous low fat vegan cauliflower cheese sauce and roasted vege. I occasionally have a look at fatfreevegan so I will have a look at Susan’s recipe. She’s always got great ideas. Or, instead of a vegan cheese sauce, how about thick homemade nutmilk mixed with a bit of mustard or horseradish? I think I will try it this way soon. Or even just finely mill some nuts with nutritional yeast and scatter between the layers. G’day Love your recipe and photos Kellie, true! 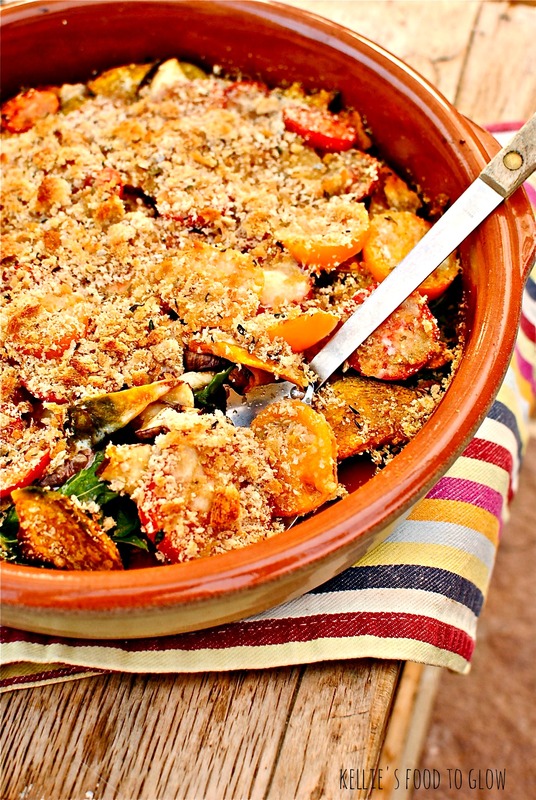 Love how a class comfort dish CAN be a lot healthier for us all too! I am glad you as a cookery teacher approve of the pre-cooking. I know it is an extra step but it is easy and I do think the result is better than just plonking it all in a dish and baking. The kitchen section is the only part of TK Maxx I visit. I am hopeless at clothes shopping if it isn’t in a sensible, colour-coded order. Must be my age! This idea rocks my world. Perfect for autumn and a great way to use up all manners of veg. I might try this with nuts instead of cheese… thanks for the inspiration! Thanks Monica. Yes, nuts would be great. Maybe with nutritional yeast milled in with the nuts? This looks great and simple enough to do for a weeknight meal. Great stuff. The recipe is an alternative not complete replacement. Room for both! Kellie, love the sound of this gratin! Healthy, AND delicious! I’m so excited! I purchased the same vessel and didn’t realize it would be the perfect dish for a gratin. Even better, squash arrived in my csa. This will be the perfect meat free Monday meal. Yum! You know, this looks like the kind of thing that is a bit of work up front with all of the roasting and whatnot, but if you did that ahead of time it’d come together in a flash. We’re in the habit of coming home from the farmer’s market and roasting the veg we like to eat roasted (like beets) so we’ve got them ready to go in the fridge throughout the week. I’ll have to get my hands on some squash and do the same with it, and who knows what kind of gratiny goodness could come out of it! Reading this before breakfast is not a good idea! I think fall has finally arrived for me, looking at this mouth wateringly delicious dish!!! Thanks EA, and thanks for the pinning-love too! This looks really lovely. Do you have any idea of the calorie count? I’m trying to lose some weight between now and Christmas and calorie counting seems to be working for me. Hi there. I don’t have the count but you could plug the amounts into any online nutrition calculator (it takes a wee while), such as the one at Self magazine. I don’t put it up because it is something I don’t encourage for the folk I see on my weight management courses but I know it can be useful for many. I emphasize behavioural change model instead. But this is more about long-term rather than short-term goals. At an educated guess I think a serving out of four would be about 370 calories. 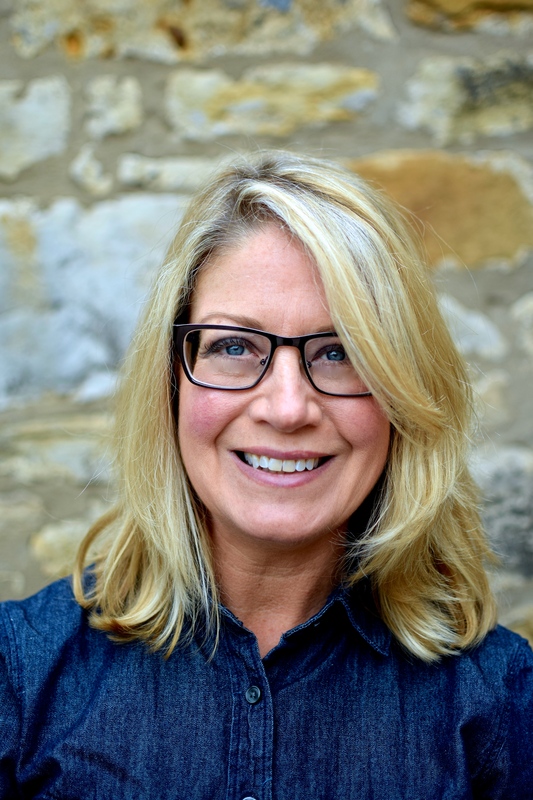 Her posts are fantastically enlightening, feel good, and good for you. Highly recommend.